Winterground Fairlands - A World Of Funmagineering! 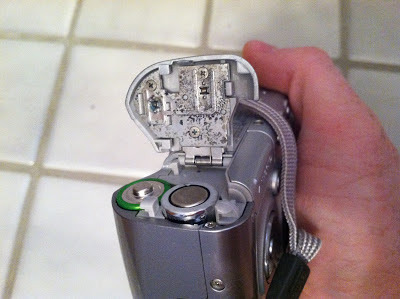 : Repairing a Digital Camera: Battery Explosion! I like to collect old pocket computers and gadgets. One of the things I encounter often is exploded batteries. 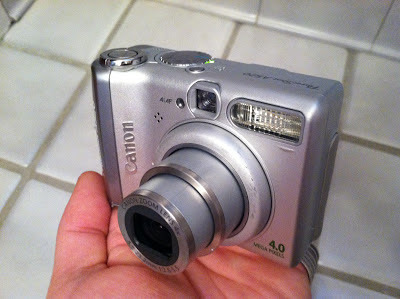 I recently rescued a Canon Powershot A520, and it seemed to be completely dead, probably due to poor battery contact due to the previous batteries exploding. I've read stories of other people using watered down vinegar to remove the alkaline, but I instead use just vinegar. I dip a paper towel in it, and saturate the affected areas. If you listen closely, you can hear it fizzing. Ssszszszsszszszs! After a few saturations and wipes with paper toweling, I had removed most of the alkaline gunk. From here you can clean it with a baking soda paste, but for this, I just decided to scrape the contacts a bit. It would power on, then immediately turn off. I tried my second set of rechargables, and the same thing happened. I re-cleaned the contacts, but that didn't seem to help. It was at this point that I thought I knew why it had been dropped in the recycle pile. Then I realized that my AA rechargables put out 1.2v each, rather than the 1.5v of alkalines. The camera has a requirement printed on it of 3.15 volts. 1.2 plus 1.2 does not equal 3.15.... I found a fresh pair of alkalines and dropped them in, and sure enough, it works perfectly! As a sidenote, I also set up my computer at home to host the EyeFi software, and it drops the downloaded pictures into a Dropbox directory. Now, all of the pictures taken with the camera are instantly shared when I'm home. I have no reason to manually sync the card physically now. Yay! I highly recommend the ni-zn 1.6v rechargables for fussy devices like this. I got a charger a 4 batteries off eBay for cheap and while not a very fancy charger I can use the batteries in my remotes without the massive drop in range the 1.2v cells have. I didn't know about those... Good to know! I'll have to pick up a few of them. :) Thanks! Have you ever experienced the problem where the A520 quickly shuts off even with a fresh pair of alkaline batteries? 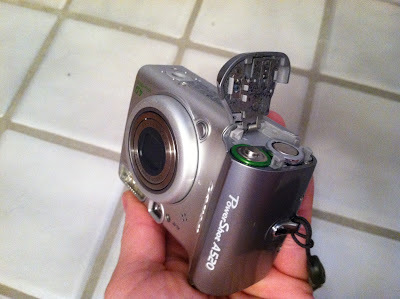 Supposedly it's caused by poor contact between the battery terminals and the batteries, and there's a fix posted online where inserting a small piece of wood (from a toothpick, actually) would improve the contact. If you've had this problem and you fixed it with this solution, can you please tell me how you did it? I can't get it to work.